I had a group of girls over to watch the premier of The Bachelor. My favorite part about hosting is coming up with unique, yummy, and fun treats! I chose a few different recipes for small, appetizer foods that were girl friendly. I found this recipe on Pinterest but it's originally from a blog called What's Gaby Cooking. The basic recipe is below but I encourage you to check out her post to get the best tips and tricks (and pictures!) for making these come out just right. I changed this recipe up a little bit by adding in Knorr Vegetable Soup Mix, which is what I generally use to make spinach dip. I used about half of the package in this recipe. I made the dip the day before and refrigerated overnight. I also baked the wonton wrappers the day before and stored them in a zip lock for the next day. This made it easy to just fill and bake right before the party. Preheat oven to 325°F. Spray miniature muffin pan cups lightly with cooking spray. Press 1 wonton wrapper into each cup and lightly spray with cooking spray. Bake about 10 minutes until light golden brown. Remove shells from pan; place on a cooling rack and repeat with remaining wonton wrappers. In a large bowl, combine the spinach, artichoke hearts, cream cheese, sour cream, parmesan cheese, red pepper flakes and salt and pepper. Taste and adjust salt and pepper as needed. You can also add 4 tbsp of shredded mozzarella cheese if you’re craving some addition goodness. Mix this together with a fork and transfer to a piping bag or a large zip lock bag. If using a zip lock bag, trim a medium hole on one of the bottom corners. Pipe the mixture into the cooled wonton cups until the mixture almost reaches the top. Transfer the spinach artichoke cups back into the mini muffin tin and bake for 8-10 minutes until the wonton wrappers turn a darker golden brown and the spinach artichoke dip is warmed. Remove from oven and repeat with remaining cups. Serve immediately. I used The Pioneer Woman's recipe for twice baked potatoes. Her recipes have not yet failed me and she always has good tricks. I learned how to hold a hot potato and cut it in half easily without burning my fingers or mangling the potato! These are pretty basic and super easy. I used her recipe exactly except for two things: I didn't add bacon bits and I didn't have any Lawry's seasoning so I made my own seasoning with a combination of paprika, red pepper, and cumin. I suggest going to her site to check out the recipe because she has some great pictures to make it easy to follow. I also made these two nights before the party. I had them stuffed and on a tray ready to pop in the oven before the party. You can do this too, but don't make them more than a couple days ahead. I used another Pioneer Woman recipe for these. I thought they were so cute and the perfect idea for a group of girls. And any leftovers I had made for a great addition to our lunches. The Pioneer Woman taught me how to cut perfect julienned vegetables in this recipe using a Japanese Mandolin. So I went to Bed Bath and Beyond to get one, and purchased a Mandolin. When I started using it, I realized I got the wrong one - there really is a JAPANESE style mandolin where it actually cuts the sticks. A regular mandolin only cuts thin slices. Argh! I cut up all of the veggies and made the spread the night before. This made it easy to grab all of the ingredients before the party, stuff the rolls and cut them up. Be sure to leave some time to refrigerate the rolls after they are assembled and cut! Make the herbed cream cheese by combining the softened cream cheese with the chives, parsley, basil, salt and pepper, and lemon juice. Stir to combine. Spread cream cheese in a thin layer over the tortillas. Lay ingredients down the middle of the tortilla: for the turkey rollup, use turkey, carrots, and cucumber. 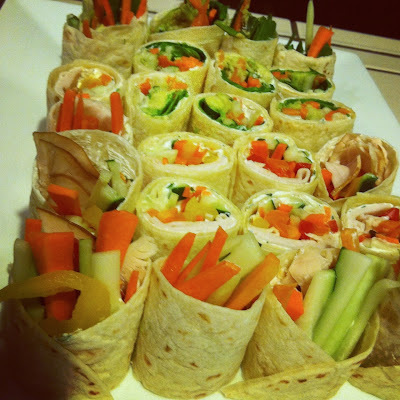 For a "salad" rollup, use lettuce, carrots, cucumber, and avocado. Let the veggies extend past the edges on either side. Roll up the tortillas as tightly as they'll go, then wrap each rollup in plastic wrap and refrigerate for one hour. To slice, cut each rollup exactly in half, then line up the two halves and cut them in half again. Stand the end pieces up so that the veggies stick out the top. And lastly, I found these delightful mini cheesecakes on Pinterest from a blog called The Italian Dish. I saw the cute tiny mason jars for this recipe and knew I had to have them! I found them at the regular grocery store near the baking aisle. I bought 12 jars and cut this recipe in half (recipe makes 24). I made these the night before. Be sure to keep them in the refrigerator up until serving! - I also added in some of the lemon juice from my lemon. The lemon was so insanely fragrant, I knew it couldn't hurt. Other toppings: You can also use mini chocolate chips. You can really do anything you like for the toppings. All kinds of fruit would work, caramel sauce, meringue, etc. Spray the jelly jars with non-stick cooking spray, making sure to spray the bottoms so the crust doesn't stick. Blend the graham cracker crumbs, 2 tablespoons of sugar and melted butter in a bowl. Place about 1 heaping tablespoon of the crumbs into each jelly jar and tamp down to make the crust (I used a wine cork). In a large mixer bowl, mix the room temperature cream cheese with the 3/4 cup of sugar until smooth. Add the eggs, one at a time, and mix well. Add the sour cream, vanilla and lemon zest and mix until well incorporated. Fill each jelly jar with about 1/3 cup of the filling, leaving room at the top for your topping. Place the jars in a large roasting pan or two deep baking dishes. Fill the pan with hot water halfway up the jelly jars. Place in the oven and bake for 30 minutes. Remove jars with tongs and place on a wire rack to cool. For the raspberry topping: pick over the raspberries and discard any that are moldy or bruised. 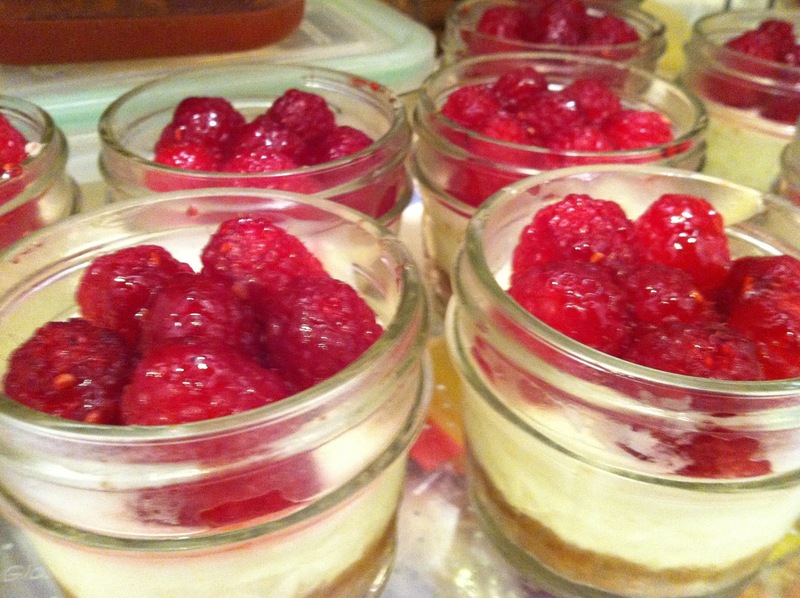 Place 7 raspberries on top of each cheesecake. Heat about 1/3 cup of the jelly in a microwave and stir so that the jelly is spreadable. Brush the tops of the raspberries gently with the jelly to glaze them. Refrigerate cheesecakes until ready to serve.